This poker strategy guide is written by tournament veteran and WSOP Main Event Champion Tom McEvoy. This particular book focuses on no-limit tournaments and takes you from starting hand standards to gameplay strategy. This is a great pickup for a beginner getting into tournaments but advanced players will also find strategic value in recovering fundamentals. Useful sections include advice on how to play specific hands from each position during tournament play. If you find yourself in a tournament rut, this can be a handy reference point to get your game back on track. Sections include ways to play big pocket pairs, baby pocket pairs, and Ace-x. While the strategy in this book mostly focuses on tournament play, fixed-limit players might find it to be a good introduction to the no-limit format in general for use in ring games as well since an entire section is devoted to the differences between limit and no-limit Hold'em. McEvoy gives useful information on how much you should bet and when - which is what most players new to no-limit have trouble with. 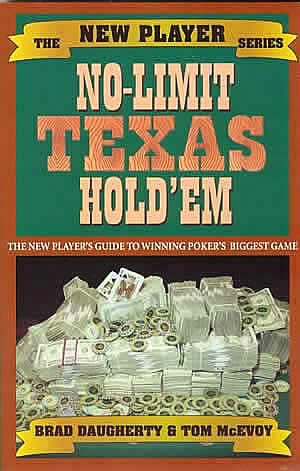 Overall, this book is probably best suited for players who want to learn how to play no-limit tournaments properly. If you've only played at limit tables before, I highly recommend this as your start to the format. Advanced players might not find too much in-depth strategy that they don't already incorporate into their game, but beginner's and new tournament players should especially pay attention to the opening section on how to play specific starting hands.